This isn't how it is for most 21 year olds. Most of them are in college, studying, partying, trying to get by working at a part time job they'll later roll their eyes about. For Matt Murray, things are a little bit different. For Matt Murray, an entire city is on his shoulders. And you'd never guess it from his reaction. Heading down the stretch it was Marc-Andre Fleury's post season redemption tour. Previous stops had been hampered by a lack of offense and a beat up defense. 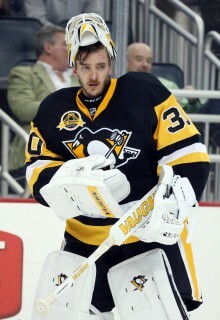 It was his turn to stop the naysayers and cement his legacy as Pittsburgh's best goaltender. A concussion stopped that in its tracks. 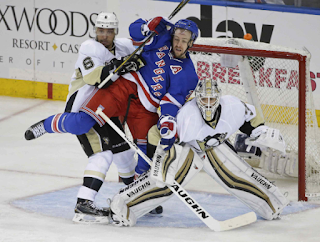 Suddenly the unstoppable juggernaut of the Pittsburgh Penguins seemed in trouble. Until the kid who won't turn 22 until May 25th, the kid who was a 3rd round pick in the 2012 Draft, a kid who had blossomed in to a top end prospect came in to save the day. Playing remarkably well down the stretch in place of regular back up Jeff Zatkoff, whose Game 1 heroics have earned himself a memorable page in Penguin lore, he posted a 9-2-0 record while sporting a gaudy .930 save percentage. It seemed ideal, but the playoffs were around the corner and Fleury would be back. Thanks, kid. Instead the concussion lingered. Fleury was not ready to go. A process that was a few years away, the process of handing Murray the keys to the car, was suddenly put in to fast forward. Suddenly the Penguins had no choice. Once Murray was healthy, it was his team. It's very easy to write off a rookie playing in his first playoff atmosphere. It's very easy to imagine any highly touted prospect coming in under the lights of Madison Square Garden, looking across the ice at Henrik Lundqvist, and wilting. It's very easy to see Matt Murray's regular season carriage turn back in to a pumpkin. The reality, thus far, has been anything but. Murray stated following game three, "The nerves were definitely going at the start of the game. I think that's understandable. It's my first playoff game, at MSG no less. I was able to control it, though, and that's all you can ask for." 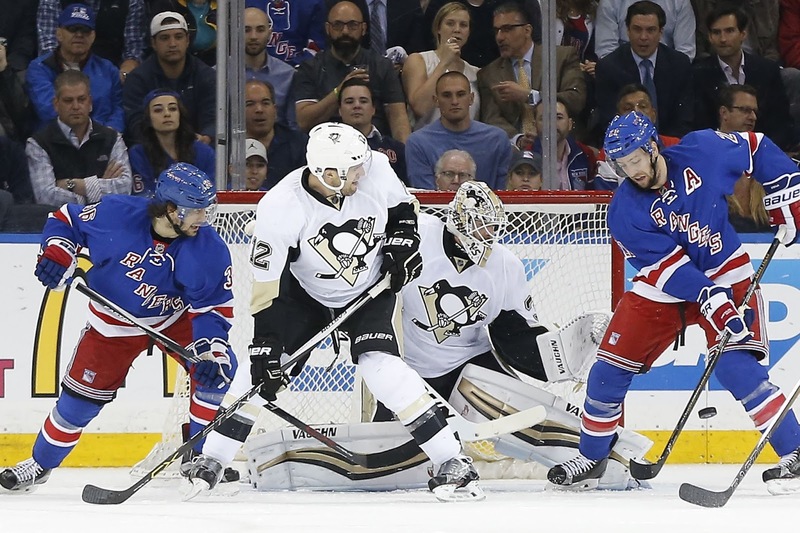 Looking calm, collected, and effortless in two games as starter Murray has stonewalled the Rangers. Allowing one goal on total of 47 shots, posting an outrageous .979 save percentage, and giving the Penguins a commanding 3-1 series lead over the Rangers? It's seemed like child's play to the guy whose contemporaries are sitting in Starbucks typing up reports. "Big focus of mine is to not get too far ahead of myself and really just be in the moment and not think about all of the noise that's going on around the game and just focus on the task at hand, and I was able to do that." Murray said following his first start in the playoffs. 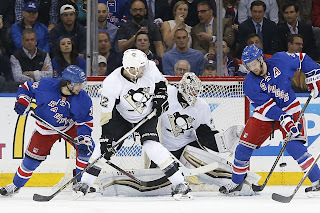 Following his second start, which included his first ever NHL Playoffs shut out, which saw the Penguins take that lead and look to put the Rangers away at home? He was just as calm, poised, and cool. "A win is a win. It feels good. At the same time, at this point in the season it really doesn't matter until you get the fourth one. I know its cliche and you hate hearing it, but we are taking it one game at a time. That's how you have to approach these types of situations. We'll enjoy this one for the night and move on." he told reporters after Game Four. Marc-Andre Fleury's time in Pittsburgh may not be up. Not yet. It's still his team. It's still his time. But Matt Murray is taking his moment and shining bright. He's owning it and giving Penguins fans a glimpse of what's to come, one game at a time.